Created in 1928 by Sanford’s city engineer, Fred T. Williams, this surveyor's map depicts Seminole County, Florida. During his tenure as city engineer from the 1920s through the early 1940s, Williams created multiple maps that show how Sanford has changed as the city limits grew and the city become more populated. Unlike some of the previous maps created by Williams, there seems to be no legend detailing the map. This particular map is difficult to read due to fading. The City of Sanford was founded by a lawyer and diplomat from Connecticut by the name of Henry Shelton Sanford (1832-1891), who purchased 12,548 acres of open land west of Mellonville. His vision was to make this new land a major port city. Situated on Lake Monroe at the head of the St. Johns River, the City of Sanford earned the nickname of “The Gate City of South Florida.” Sanford became not only a transportation hub, but a leader in the citrus industry globally. The Great Fire of 1887 devastated the city, which also suffered from a statewide epidemic of yellow fever the following year. The citrus industry flourished until the Great Freezes of 1894 and 1895, causing planters to begin growing celery in 1896 as an alternative. Celery replaced citrus as the city's cash crop and Sanford was nicknamed "Celery City." In 1913, Sanford became the county seat of Seminole County, once part of Orange County. Agriculture dominated the region until Walt Disney World opened in October 1971, effectively shifting the Central Florida economy towards tourism and residential development. 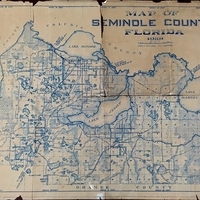 Original 30.5 x 22.5 inch map by Fred T. Williams, 1928: Museum of Seminole County History, Sanford, Florida. Digital reproduction of original 30.5 x 22.5 inch map by Fred T. Williams, 1928. Originally created by Fred T. Williams. Bentley, Altermese Smith. Seminole County. Charleston, SC: Arcadia, 2000. "Seminole County Government ." Seminole County Government. http://www.seminolecountyfl.gov/index.aspx. Early Days of Seminole County, Florida: Where Central Florida History Began. [Sanford, Fla.]: Seminole County Historical Commission, 2002. 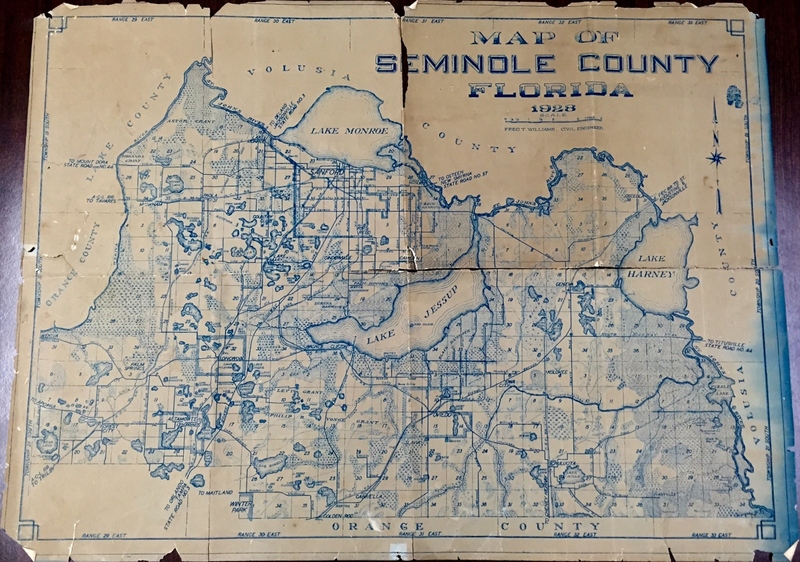 Williams, Fred T.. “Map of Seminole County, Florida, 1928.” RICHES of Central Florida accessed April 22, 2019, https://richesmi.cah.ucf.edu/omeka/items/show/6432.